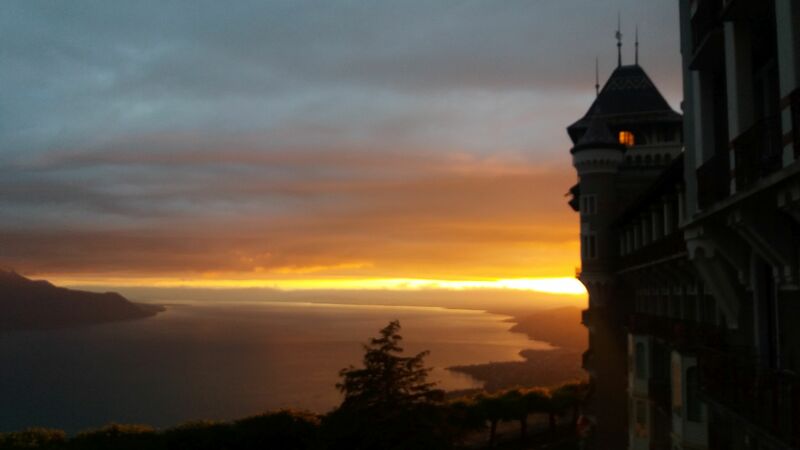 It is a true honour to take part in the Caux dialogues. On this the final day, as the sun sets over lake Geneva I will just share some general impressions. This year’s conference focused on the challenge of migration. Most migrants come from dry land areas where climate change is creating tension as food productivity falls. These tensions over land reduce the ability to manage resources worsening degradation and resulting in more conflict. The conference brought together policymakers, scientists, activists and farmers to chart ways to unpack the complexity in the challenge. Where peace is negotiated, land is not at the table. We heard from several peace mediators that the functioning and needs of the land was seldom part of the peace process. And that a large proportion of peace treaties do not last. It seems important that status of land and its ability to provide a house for humanity must be a common priority for both sides of a conflict. Much more work in this area is needed to develop ways to resolve conflicts so land status is maintained and improved. This will encompass a range of disciplines like lawyers, land assessors, agriculturalists, botanists, soil scientists and economists. When agriculture is industrialized and commercialized diversity dies. More than 90 percent of crop varieties have disappeared from farmers’ fields. Today, 75 percent of the world’s food is generated from only 12 plants and five animal species. (Source FAO.) It is clear, to me at least, that a capitalist industrialist approach is destructive for food security as it drives land and diversity degradation. Maybe we don’t have to abandon capitalism completely but as a means to produce the basics as the heart of a healthy, sustainable culture is has a lot of problems. We need an alternative economic approach as well as an alternative production approach. Thanks to Patrick Worms from the World Agroforesty Centre and Joseph Simcox, the Botanical Explorer for these insights and more. We saw how drones can fly over land to effectively survey it, analyse it, map it and indeed prepare to restore it by mass-seeding from drones. We saw how this kind of mapping can bring clarity to various stakeholders to help them frame agreements and indeed keep track of all the small agreements needed to create one large, stable investment opportunity. But the benefits of land production seldom fully come to those create that value. We saw examples of how land restoration helped secure water supply to cities, to increase crop production, to reduce flooding and drought risks, but the economic benefits did not flow back to those who stewarded the land. This is serious because it gives no incentive to do what humanity ought to be doing: stewarding the land. And it goes deep. It goes right down to legal rights of land, rules about emissions and economic and fiscal policy. Here again we need a re-think: How can we make land stewardship profitable for the stewards? This huge palace, that was used as a place to start conciliation after the two world wars, was bought by just 100 Swiss people. It has served as a physical location for peace and reconciliation work since then. I leave the conference hoping that we can maybe start a fund, and it might only take 100 people to do it. The fund would invest in peace by investing in land restoration in a way that made sure the value added came to those who steward the land.